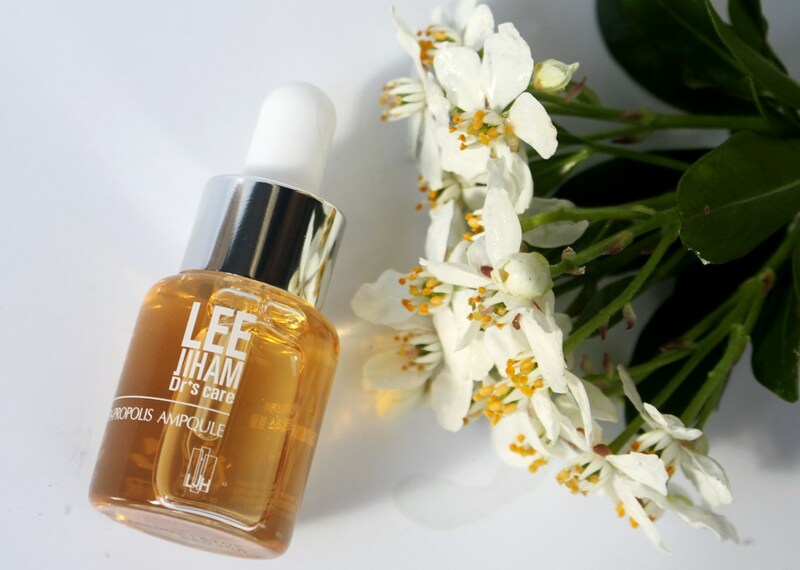 The LJH Vita Propolis Ampoule claims to be the perfect combination of vitamin and propolis for bright, glowing and radiant skin with powerful ingredients delivering moisturisation, firming, soothing and anti-ageing effects. Propolis Extract is basically a combination of beeswax, enzymes and tree sap used by bees to seal, disinfect and waterproof their hive. Coincidentally, it also makes an excellent skincare ingredient, found at a high concentration of 50% in this ampoule. It has been used medicinally to help heal wounds for centuries. Rich in flavonoids, propolis displays powerful antibacterial, antifungal and antiviral properties. Its high antioxidant content assists to keep free radicals from causing cell damage. It works to regenerate and moisturize skin, helping make it smooth, supple and hydrated. It also assists to balance skin oils so is a good acne treatment. Portulaca Oleracea is an annual plant traditionally used in oriental medicine. It is an excellent source of antioxidants and omega-3 fatty acids, making it effective at stimulating cell regeneration. High levels of Vitamins E, C and beta carotene help it to brighten skin tone and reduce UV induced damage, hence slow the formation of wrinkles. 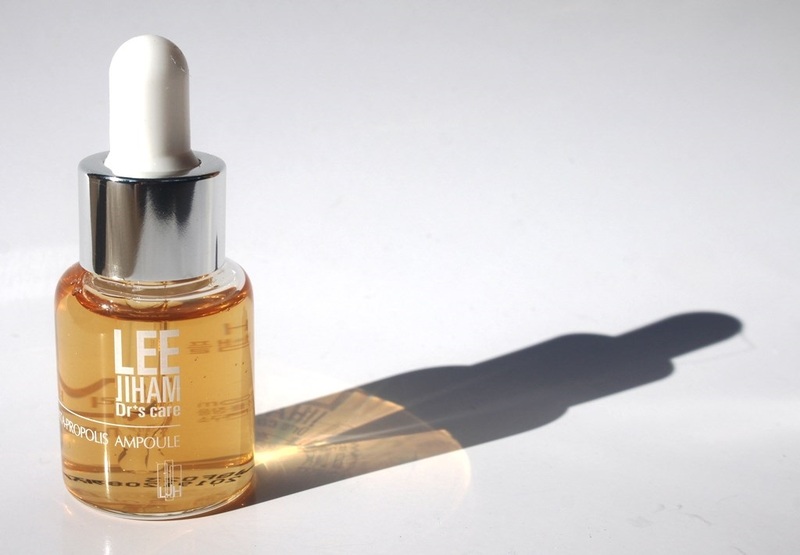 Sea Buckthorn Extract contributes 10% of the ampoule formulation. It is a super skin food comprising Vitamins C and E, folic acid, carotenoids, omega fatty acids and flavonoids. These amazing components give it the ability to reduce wrinkles, hyper-pigmentation and photoageing as well as stimulate collagen production. It is good for acne as it helps to keep pores clean. 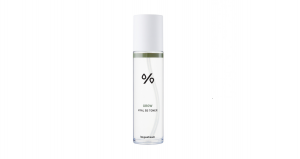 Making up 26% of the ampoule are Witch Hazel and Gotu Kola extracts. Witch hazel extract displays potent antioxidant properties, similar to green tea. It contains polyphenolic compounds that help protect skin from UV damage and photoageing whilst also offering anti-inflammatory benefits which sooth redness and irritated skin. Gotu Kola Extract is rich in amino acids, beta carotene, fatty acids and potent phytochemicals useful for calming inflammation and stimulating new cell growth. Spirodela Polyrrhiza Extract, Adenosine and Licorice Root also contribute soothing and healing properties. 20% of the ampoule is represented by three essential vitamins, B3, B5 and C. Present in all living cells and included in the formulation due to its penetrative, moisturising and hydrating powers, Panthenol, vitamin B5, is a humectant which also offers soothing effects. Niacinamide (vitamin B3), assists to visibly improve the appearance of enlarged pores, uneven skin tone, fine lines, dullness and to strengthen the skin surface. Vitamin C is represented by Ethyl Ascorbyl Ether, a stable form with many skin benefits. It exhibits an excellent whitening effect through the prevention of melanin synthesis and also displays high antioxidation, neutralising free radicals. Additionally, it has antibacterial and anti-inflammatory properties and is able to accelerate collagen synthesis and skin repair thus enhancing skin elasticity. Finally, Sodium Hyaluronate is the sodium salt form of hyaluronic acid which provides skin hydration with its water retention properties. All up, this compact formulation of only 16 ingredients presents a powerhouse of skin foods. 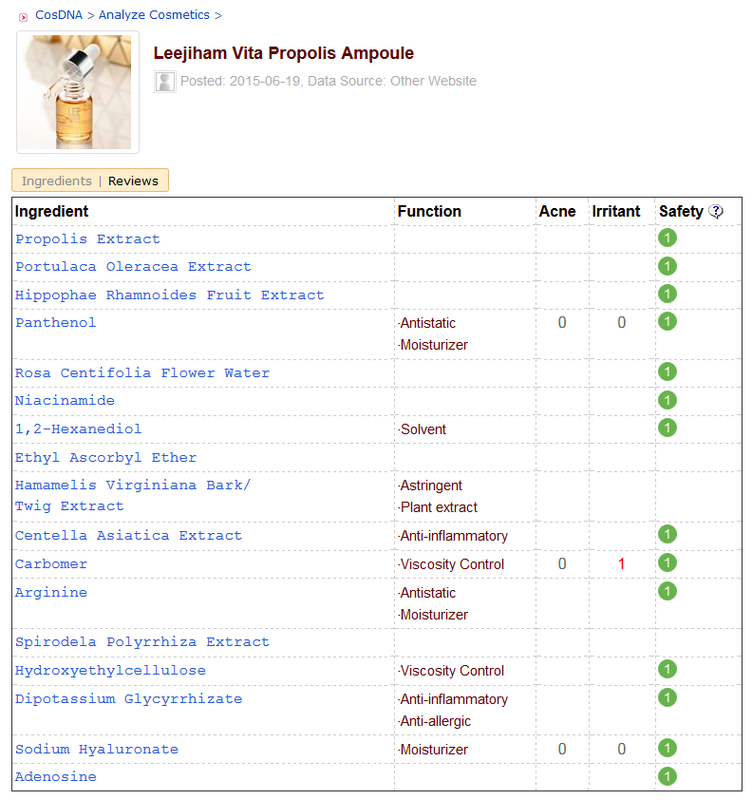 The LJH Vita Propolis Ampoule comes in a petite clear glass bottle with screw top lid dropper applicator. 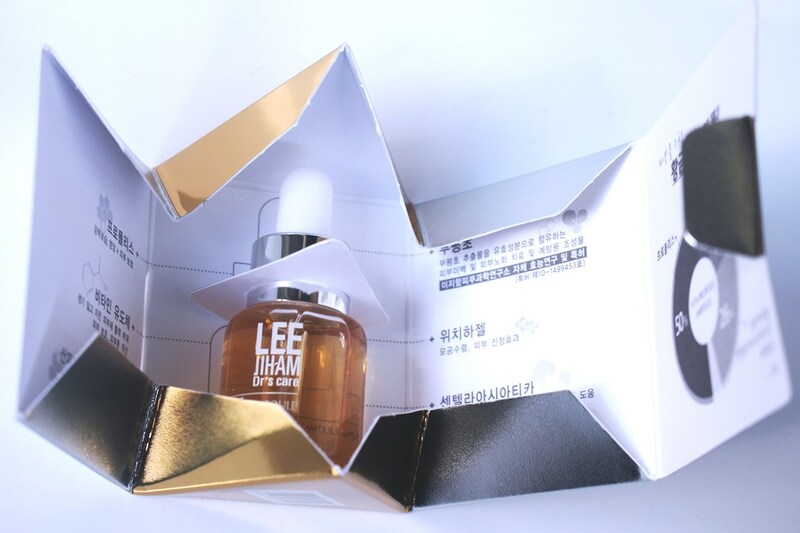 The pyramid packaging is super cute, keeping the bottle in place whilst also providing product information (albeit in Korean). Both the CosDNA and EWG reports return an ideal hazard rating. The formulation is free of parabens, silicones, colorants, alcohol and mineral oils. 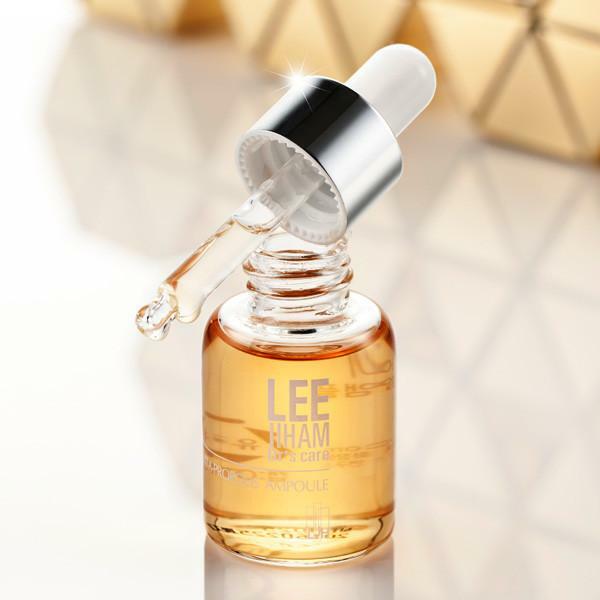 The product directions advise to use this ampoule after cleansing and toning by spreading a pea size amount onto skin in an outwards motion and to follow up with a moisturizer and SPF during the day. However, due to this product’s versatility and gentle yet potent nature, it can be added at almost any step following toning: alone by patting it into the skin, or alternatively by mixing a few drops into serum, moisturiser or foundation for instance. All methods are highly effective. This little bottle sells for anything between around AUD$20.00 and AUD$65.00 depending on where you look for it. I’m not sure of the recommended retail price. A lot of eBay sellers list it for under AUD$20.00. Although there may be a legitimate one here and there, exercise caution as if it’s too good to be true, it probably isn’t. 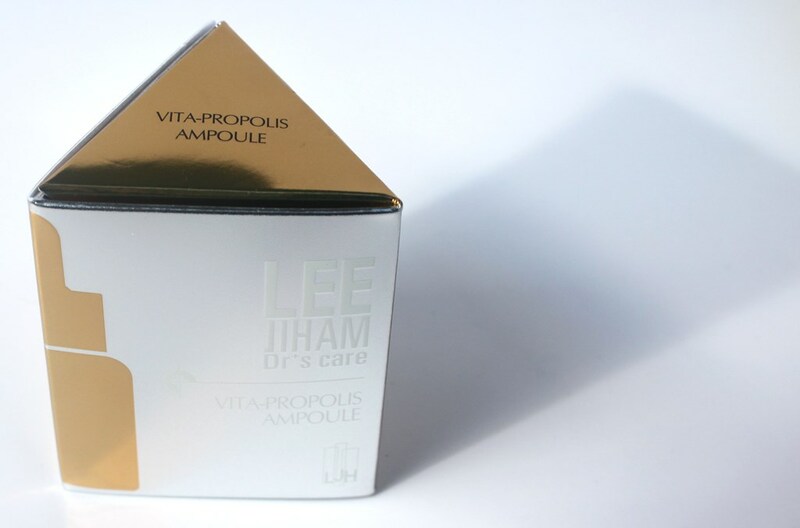 The LJH Vita Propolis Ampoule is a Korean product, available online at skincare and beauty boutiques, eBay etc. I picked mine up from RoseRoseShop at the lower end of this price range. The ampoule has a life expectancy of over two years. It was difficult to determine its exact shelf life given the product information is primarily in Korean and the manufacturing date rarely coincides with dispatch. I received mine in September 2017 and it is stamped (yyyymmdd) with an expiry of December 2019 or possibly August 2019 (yyyyddmm). If I had to guess, I would say shelf life is likely 3 years and at least 2. 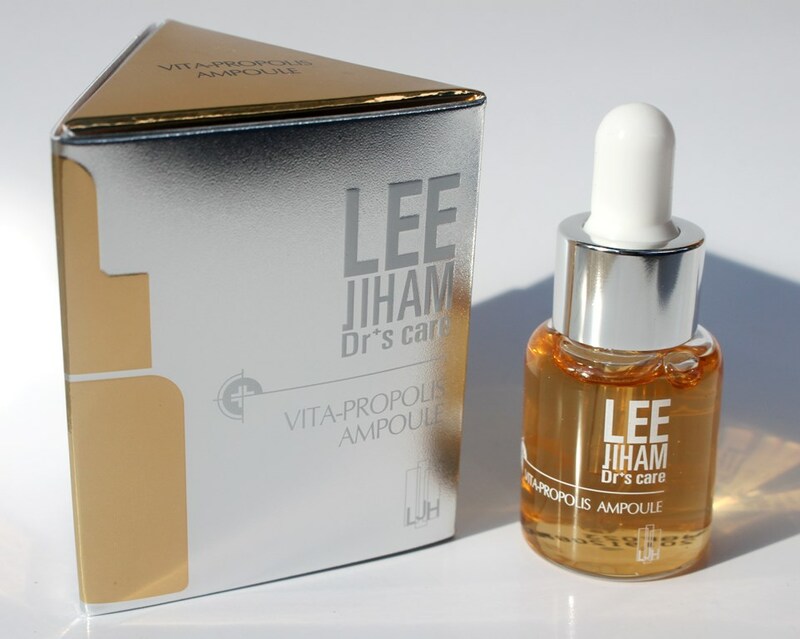 It is encouraging to know that this ampoule is manufactured under the instruction of a qualified Korean dermatologist, Dr Lee Ji Ham. The presentation of the ampoule is similar to many other like products. The dropper makes it easy to dispense hygienically and in a controlled manner. It doesn’t readily drip, which is great considering the tiny volume, assuring none is wasted. You can squeeze it gently for a small drop or apply firmer pressure to release more product. A little goes a long way, so you only need 2-3 drops to cover the entire face. Given it is stored in a clear glass bottle, there is probably little risk of degradation brought on by light exposure. The ampoule has a pleasant golden colour and is more viscous than water. It has been part of my skin care routine for three months, applying it twice daily in order to accelerate results. I have used it sparingly, applying controlled drops each time, trying to make it last as long as possible. During this period, I finished the entire 15ml. As such, I imagine with single daily use it might last up to 6 months depending on how heavy handed you are in application. I pat it into my face or alternatively mix it with my moisture serum (currently using the one by Pyunkang Yul ) or moisturiser as a last step. Any tackiness it might produce is unimportant as it is covered by subsequent layers or combined with them so takes on their absorption qualities. The ampoule is so gentle, as indicated by the outstanding ingredient analysis and low hazard rating, that it is definitely suitable for all skin types, each getting something different out of it. Oily and acne prone skin will benefit from the pore detoxification and balancing of facial oils provided by both the propolis and sea buckthorn extracts. The strong protective properties of antioxidants and anti-inflammatory ingredients will help to sooth and protect sensitive skin. Mature and dry skin will appreciate the hydration provided by the propolis extract, panthenol and sodium hyaluronate whilst sea buckthorn as well as Vitamin C and portulaca oleracea extract will also deliver anti-ageing benefits. Of course, normal skin will just soak it all up. It feels light with plenty of slip, so you can apply it alone or in combination with another product. I don’t think the application choice makes any difference to the impact it has on skin, it just gives you the opportunity to use it in your preferred way. It can however give you a smoother canvas for makeup application. As for addressing the product claims, well, the skin tone and texture of my face improved almost instantly. Within a week, my skin was looking brighter and smoother. The radiance this little potion achieves is not glossy or shiny but rather a healthy, natural looking glow. The skin is simply fresher in appearance. The results were sudden but very welcomed. Other claims of this ampoule involve skin softening and moisturizing. I found that the increased smoothness of my skin went hand in hand with improved softness. During the trial period, I consistently used other products that also contribute these properties. For the first half, I followed the ampoule/moisture serum layer with Thank You Farmer True Water Light Gel Cream as a morning moisturiser, the Innisfree Olive Real Power Cream in the evening and the Physicians Formula Oil Exilir in both routines. In the latter part of the trial, I replaced these with the Huxley Anti-Gravity cream, the Trilogy Age-proof Replenishing Night Cream and the Goodal Waterest Lasting Water Oil booster serum respectively. 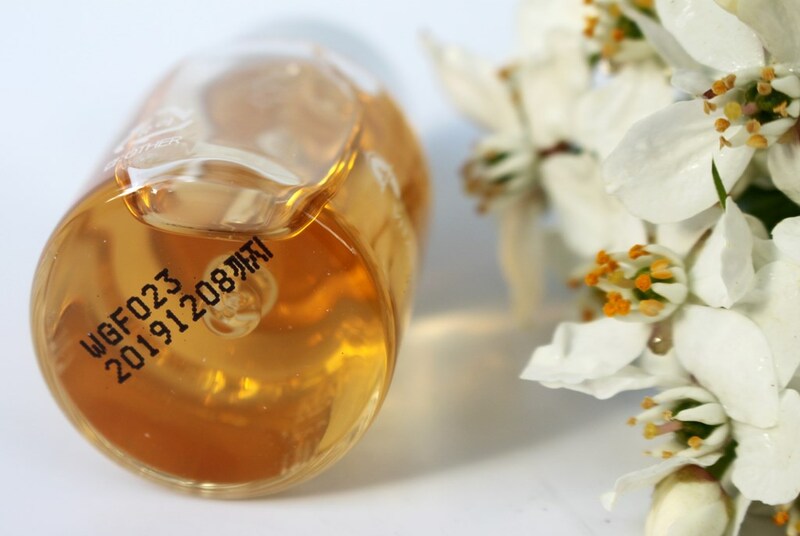 All are super moisturising in their own right, so it is not possible to confidently gauge the actual measure of improvement in moisture levels that can be attributed solely to the vita propolis ampoule. However, as the remainder of my routine was static before and during the first part of the trial period, I am confident that skin softness, smoothness and radiance improved because of it. The final claim is an improvement in skin firmness and anti-ageing effects. I didn’t see any change in fine lines and wrinkles although their appearance is probably diminished by plumper, smoother skin. The product does not claim to reduce existing lines but aims to prevent new ones, so on that front, it can be said to deliver since hydrated skin is less prone to ageing than its dehydrated counterpart. In summary, my skin really benefited from this ampoule. It was revitalized, smoother, softer, plumper and more even in tone. The performance really tells the complete story. There is nothing left to say other than to declare this as a superb ampoule. The boost to softness and hydration gave my skin glow, made it plump and healthy looking. It improved the perceived appearance of fine lines and wrinkles and contributes ongoing anti-ageing effects. Furthermore, a formulation inclusive of propolis and sea buckthorn at high concentrations appears promising as an acne preventative or healing treatment (although no anti-acne claims have been presented by the manufacturer). As such, this would suit every skin type. Having achieved such excellent results in a relatively short period of time, the only thing that will stop me using this product consistently over the long term is my desire to trial other propolis based ampoules to compare performance. The bar has certainly been set high! 5 Reasons to Use Witch Hazel in Your Skin Care Regime Cynthia Bailey, M.D. Ethyl Ascorbic Acid Spec-Chem Ind.